Cleaning up after a meeting is important for professionals renting a meeting room in coworking spaces. Leaving a room in disarray is not only unprofessional, but it will also reflect poorly on your reputation within a coworking space. Coworking spaces are tightknit groups where everyone is responsible for the space. When a person doesn’t cleanup after a meeting, it ruins the experience for the next meeting that takes place. No one wants to have a reputation of not cleaning up after themselves or respecting the coworking space that is shared amongst the community. 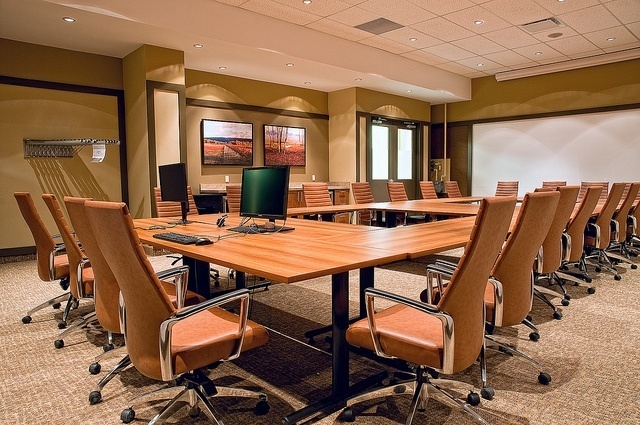 Cleaning up meeting rooms takes 5 minutes and is appreciated in all coworking environments. Cleanup all items, even catering items, brought into the meeting. Wipe down the table with a wet rag, and dry as necessary. Remove any and all trash and place it within the room’s garbage can. Erase the whiteboard when necessary. Put all equipment (projectors) back where they were originally located. Push all chairs back into the table. Shut off any equipment turned on during the meeting. Shut off all lights before leaving the room. It’s important for the person that holds the meeting and rents the room to be the last person to leave. After everyone has left the meeting, it’s time to make sure that the space is clean for the next person that rented the room. If you’re providing food or drinks and have a big meeting that will take place, make sure to allot extra time at the end of the meeting to clean the room thoroughly. Coworking spaces typically do not have a custodial staff on-site all day long to cleanup between meetings. It’s the responsibility of anyone renting out meeting rooms in Dublin to clean up when they are done.